Ever since I stated that I was giving up dating for Mardi gras, my life has been considerably quiet, as you can imagine! I’ve spent many days and nights ploughing through series of Pretty Little Liars on Netflix and a couple of weeks ago our exchange program coordinator organised a trip for us exchange students to go to an annual rodeo event in Mississippi. It was definitely a cultural experience to say the least, very interesting to see with your own eyes. We all piled into one of the university minibuses and drove out of town to the rodeo event. It wasn’t a long drive, it took about 30 minutes to get there but it is a popular event and it took us a little longer than we expected to arrive. Our exchange coordinator is 23 and recently graduated from the University of Southern Mississippi during our first semester so hanging out with her is always cool because she’s the same age and generation as us. Plus since we’ve been here a while and met many American people so we also know a lot of the same people. I was really surprised to see just how popular this event was as cars swarmed the car park and lots of people were queuing out the door to get into the arena. As soon as we got to the front doors the smell hit us like a wave. It was like being at the farms I try to avoid in my hometown- quite overpowering to one’s nose! 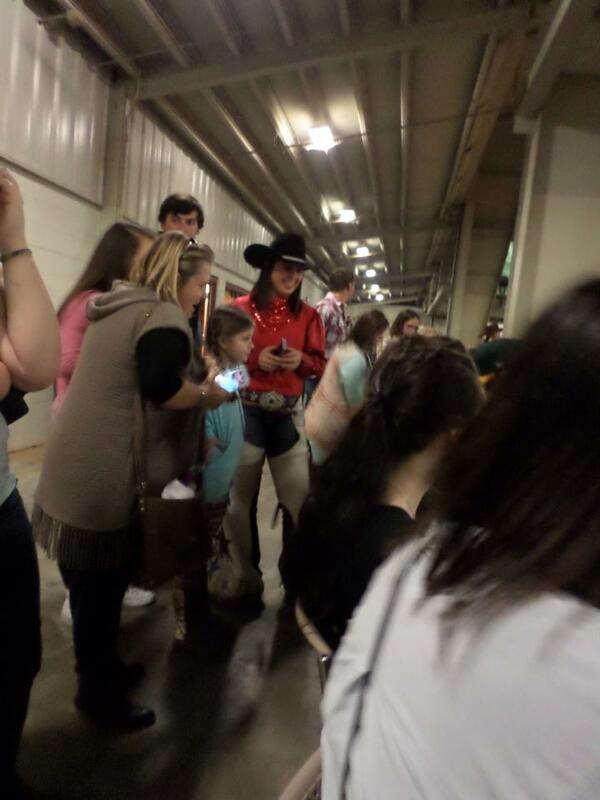 The arena was packed full of people, with some dressed for the occasion and many families there to watch the show. We got standing tickets but it wasn’t a huge arena and we had a good view. I forgot my glasses so when the rodeo began it wasn’t until the third horse that I realised that it was actually a horse. I was gob-smacked. 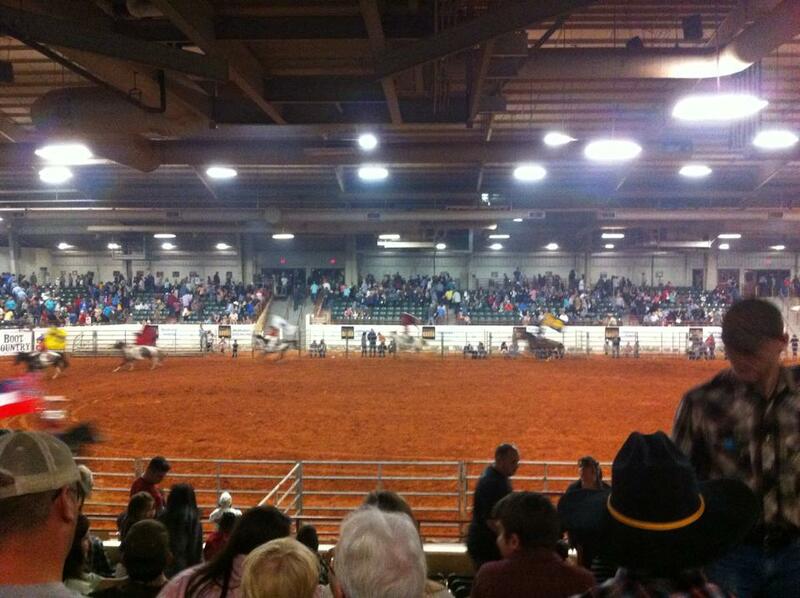 I had no idea that horses were used in rodeos! It was a strange realisation, it didn’t make me feel uncomfortable (yet) but it was definitely a “you learn something new every day” moment. After the horses there were people racing on horses trying to put tags on bull calves. THAT made me feel uncomfortable. They were just so blind (not literally) to what was going on. Since it was a competitive event the men on the horses were really going for it and launching themselves at these poor innocent bull calves. I don’t know why but the sight of these really cute bull calves made me think of hamburgers. I couldn’t hack being a vegetarian but I can see why many people decide to be. I started to think that this was animal cruelty but I tried to keep an open mind since this was a “cultural event.” It was also a good few weeks before I ate a beef burger again. Last year I read “The Longest Ride” by Nicholas Sparks which is soon to be released as a film in the cinema. As I watched the rodeo performances I kept thinking about this book. I won’t spoil it but obviously it’s a love story and one of the main characters has a serious accident after coming off a bull and is almost killed. Eventually we got to see the rodeo we were expecting and it was quite something to watch. These people were REALLY being THROWN around by these angry bulls. Watching their bodies moving like that you had to wonder what on earth makes anyone want to be a professional cowboy. But this is how some people make their money and I kept reminding myself of that. We watched the entire show which lasted for a few hours. Once the end came I felt like I had seen enough. I would agree that it is animal cruelty but in the same breath so is the act of eating meat etc… There was other performances too and they really dressed and acted the part which filled the part of cultural experience for us. I found it hard to believe that these TV stereotypes were actually true to real people’s lives. See that’s the thing about living in the USA though- it often is like walking into your TV set. Even here in the Deep South I see many sights that I feel I’ve seen something similar to on TV or at the cinema in an American produced show or film. I would never take part in a rodeo but it was good to watch, purely for the cultural experience. You’ve got to have some “balls” to do that for a career! I’m grateful for the experience and that I got to spend it with my other exchange friends. It’s definitely a very different and dangerous hobby/career to have. I had a go on a mechanical bull last semester and it ripped my superman leggings which was very frustrating. *If you know me personally then you’ll know that leggings are my thing. * I imagine there is some serious money involved in rodeo riding, due the fact it’s extremely dangerous. ← Wet Wednesday- a karma courtesy?